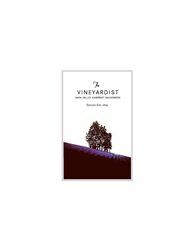 The Vineyardist is a premium winegrowing estate in Calistoga and the home of The Vineyardist. In 2000, husband and wife team, Dirk Fulton and Becky Kukkola, purchased the historic property. Inspired by Italy’s classic wine families and their passion for working the land, they searched for ten years to find a suitable site to develop into a world-class wine estate. In 2002, Jim Barbour, one of the Valley’s leading viticulturalists, was hired to redevelop the vineyards. He chose the steep, rocky hillside with well-drained soils to plant Cabernet Sauvignon. Organic farming specialist, Phil Coturri, is the estate's vineyard manager. The terrain’s daytime temperature remains slightly cooler than the Valley floor and experiences somewhat warmer temperatures in the evening due to the ocean breezes from the Chalk Hill Gap. The resulting “banana belt” microclimate is ideal for maturing Cabernet. Mark Herold was added as winemaker in 2003 to develop the wine program. A true renaissance artisan, he also describes himself as an accomplished scientist and holds a Ph.D in Ecology from University of California-Davis. His success in working with new, highly esteemed wine brands was essential to the creation of a singular wine expressing the estate’s characteristics. The first five vintages were declassified to achieve maximum quality upon our first release. Dirk and Becky continue on their path to transform the property into one of Napa Valley’s most respected Cabernet vineyards. They undertook a multi-year project to restore the original 1879 Victorian home and completed its renovation in accordance with Napa Valley landmark standards. As stewards of their land, they farm organically and sustainability. Their estate crops include wine, olive oil, citrus and culinary herbs. In the wake of The Panic of 1873 and the Long Depression, Lorenz Petersen, a Danish ship builder from San Francisco, watched hopelessly as city banks closed their doors. He and wife, Maria, had lost their savings except $2,000 he had not deposited. Determined to build a life for his family, he purchased a 180-acre property in Calistoga. He spent the next several years creating a self-sustaining farm to produce crops year-round. Lured by potential of California’s fledgling wine industry, he also planted vineyards - Zinfandel, Carignon, Alicante, Burgher, and Malvasia and harvested his first crop in 1884. Grapes were handpicked in 50 pound lug boxes, pressed and put into 2,000 gallon redwood tanks where they aged until ready for market. Pacific railcars for bottling and eventual sale. In just a few years, Lorenz became skilled at farming Calarcadia’s vineyards, crafting its wine, and marketing its production. He had become a Vineyardist. The Vineyardist is certified under the Napa Green Winery Program by the Napa County Department of Environmental Management (DEM) and the Association of Bay Area Government’s (ABAG) Green Business Program and completed all the regulatory components needed for environmental sustainability. These components included developing water and energy conservation methods, preventing pollution, and reducing solid waste. In addition to developing sustainable winery practices, this program is set to become the standard for the state of California. The Vineyardist is certified under the Napa Green Certified Land Program. The Vineyardist has created and implemented a customized farm plan with measured results that addressed all aspects of its property, vineyard land as well as non-farmed land, including practicing soil conservation, water conservation, stable drainage, riparian corridor enhancement, fisheries and wildlife habitat enhancement and long-term improvement and sustainability.